National Medal of Science Honoree Dr. Shu Chien of UCSD and Confucius Institute Director Dr. Lilly Cheng of SDSU will co-chair the tenth anniversary Asian Heritage Awards Gala Saturday, Sept. 14, at the San Diego Marquis & Marina in San Diego. The gala, to be held in the Marina Ballroom at 333 W. Harbor Drive, will honor achievement in ten categories, in addition to singling out an individual for Special Recognition as the highlight of the formal evening gala. The Special Recognition Honoree will be announced later this month, along with instructions on how to nominate individuals and organizations for one of the awards. 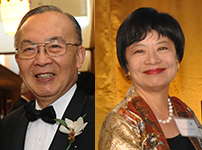 Both Dr. Chien and Dr. Cheng are Asian Heritage Awards honorees, Dr. Cheng as part of the Asian Pacific Historic Collaborative in 2004 and twice in 2010 for cultural preservation and humanitarian outreach. 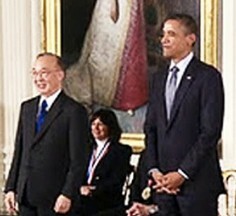 Dr. Chien received the National Medal of Science, the highest honor bestowed by the U.S. government on scientists and engineers, in October 2011, a month after receiving the Asian Heritage Award for Health and Medicine. The national award recognized Dr. Chien’s achievement in taking fundamental medical and scientific research together with engineering concept and technologies for applications to advance health care and benefit humankind Dr. Chien, a professor in UCSD’s Jacobs School of Engineering’s Department of Bioengineering, is recognized worldwide for his studies on how blood pressure and the flow of blood affects blood vessels and is one of only 11 scholars who are members of all three U.S. national institutes – the National Academy of Sciences, the National Academy of Engineering and the Institute of Medicine. Dr. Lilly Cheng, an internationally renowned linguist and professor in SDSU’s School of Speech, Language and Hearing Sciences, is director of the university’s Chinese Studies Institute and founder and director of the Confucius Institute at SDSU, which was recognized by the Chinese government in 2012 as one of eight such top institutes in the world. The institute, based at SDSU, was cited by the Hanban, or Chinese Office of Chinese Language International Council, for its work in enhancing the understanding of Chinese language and culture among those outside China and for developing friendly relations with that country. For its work, the institute was also awarded a $1 million grant from the Chinese government. Proceeds from the multiple award-winning gala will benefit the BOOST-STEM program, a collaboration between the Asian Heritage Society and Alliant International University and Cal State San Marcos that serves as a guide to future careers in science, technology and business for underserved female students of Asian and Hispanic descent. 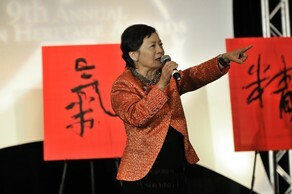 Dr. Chien with President Obama Dr. Cheng conducts caligraphy auction at 2012 gala. Dr. Chien is credited with playing a crucial role in forming UCSD’s Department of Bioengineering and guiding it to its ranking by the National Research Council as the premiere institution for biomedical engineering. As current director of the UCSD Institute of Engineering in Medicine, he “is now leading efforts to further strengthen research and educational collaborations between all six departments of the Jacobs School of Engineering and the School of Medicine and the Skaggs School of Pharmacy,” explained Jacobs’ School Dean Frieder Seible when Dr. Chien’s Medal of Science was announced. Dr. Chien was recruited to join the UCSD faculty in 1988 by Y.C. Fung and Benjamin Zweifach, who co-founded the university’s bioengineering program. The Bioengineering Department, as part of the Jacobs School, has since become a world leader in systems biology, regenerative medicine and all forms of bioengineering designed to understand, diagnose and treat human diseases. A native of China, Dr. Chien was a premed student when his family fled to Taiwan during the Communist takeover of the country in 1949. After receiving his medical degree from National Taiwan University and doctorate in physiology from Columbia University, where he taught for almost 30 years, he went on to found Taiwan’s Institute of Biomedical Sciences in 1987 and a year later was invited to UCSD. Dr. Chien is most widely known for his research regarding red blood cells and how the circulatory system works. In focusing on the malleability of red blood cells to change shape so they can pass through tiny pores smaller than a cell’s diameter, Dr. Chien and colleagues were able to show how blood flow can be regulated or engineered for efficient transportation. This led to further research on how mechanical forces such as pressure regulate the performance of cells in blood vessels, which would ultimately lead to an understanding of how blood vessels can be protected from abnormalities such as atherosclerosis. Dr. Lilly Cheng, past chair of the Multicultural Issues Board of the American Speech, Language and Hearing Association (ASHA) and education committee chair for the International Association of Logopedics and Phoniatrics, has served as associate dean of SDSU’s College of Health and Human Services and president of that schools’ Phi Beta Delta chapter. Dr. Cheng, a Fellow of the American Speech-Language Hearing Association, is also a recipient of the 1997 ASHA Award for special contributions to Multicultural Affairs and recipient of the 2002 Diversity Award from the California Speech and Hearing Association. She also serves on the board of the Asian and Pacific American Political Affairs Association (APAPA) San Diego chapter. In 2009, Dr. Cheng founded the Confucius Institute as an instrument to promote Chinese language and culture in San Diego by establishing several hubs at educational institutions. One of them was Barnard Elementary School, which was on the verge of closing until it adopted a Chinese language program under its new principal Edward Park in partnership with SDSU. The school became the first Mandarin Magnet School of its kind in San Diego and last year was recognized as one of the four top classrooms worldwide out of 530 such programs. When the Institute was established, there were only seven Confucius classrooms in the San Diego area. Under Dr. Cheng’s guidance as the Institute’s executive director, there are now 23 programs in 16 schools in San Diego alone that promote teaching and the learning of Chinese language and culture. In addition to providing training for teachers, as well, the Institute sponsors cultural activities and provides speakers to schools throughout the region. CHENG SHEN SPEECH from Rosalynn Carmen on Vimeo.